3/30/16 CEQ's Estuardo Morán presented "Fiscal Policy and Income Redistribution in Latin America: Argentina, Bolivia, Brasil, Chile, Colombia, Costa Rica, Ecuador, El Salvador, Guatemala, Honduras, México, Perú and Uruguay" in Tegucigalpa, Honduras. Click here to view the presentation. 3/16/16 As part of CEPAL's Regional Seminar on Fiscal Policy, Nora Lustig presented "Fiscal Policy and Income Redistribution in Latin America: Argentina, Bolivia, Brasil, Chile, Colombia, Costa Rica, Ecuador, El Salvador, Guatemala, Honduras, México, Perú and Uruguay" in Santiago, Chile Click here to view the presentation. 3/11/16 CEQ, The Dialogue and Fundación RAP organized “Diálogos de compromiso con la equidad" seminar in Buenos Aires, highlighting findings on Argentina. Click here to view the presentation. 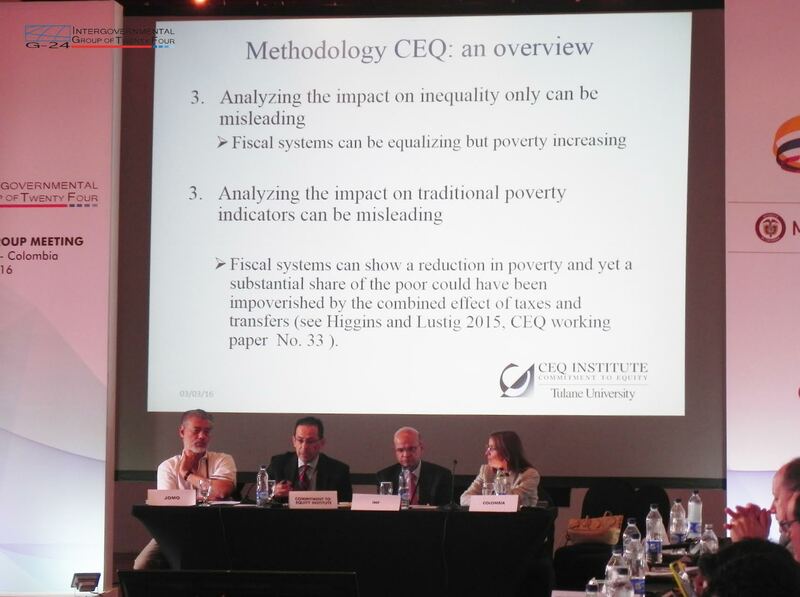 3/3/16 CEQ's Estuardo Morán presented Fiscal Policy Incidence on Poverty and Inequality in Latin America at the G-24 Technical Group Meeting in Cartagena. Click here to view the presentation. 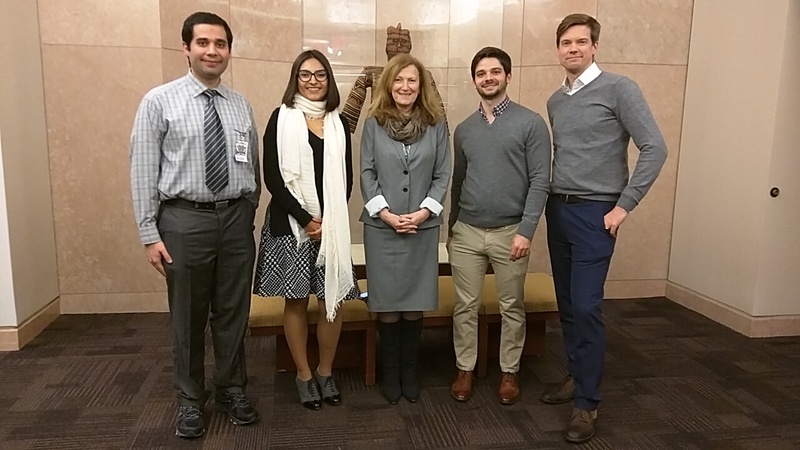 2/1/16 - 2/3/16 The CEQ team hosted a three-day workshop at the World Bank to present the Commitment to Equity methodology along with early evidence from recent studies. 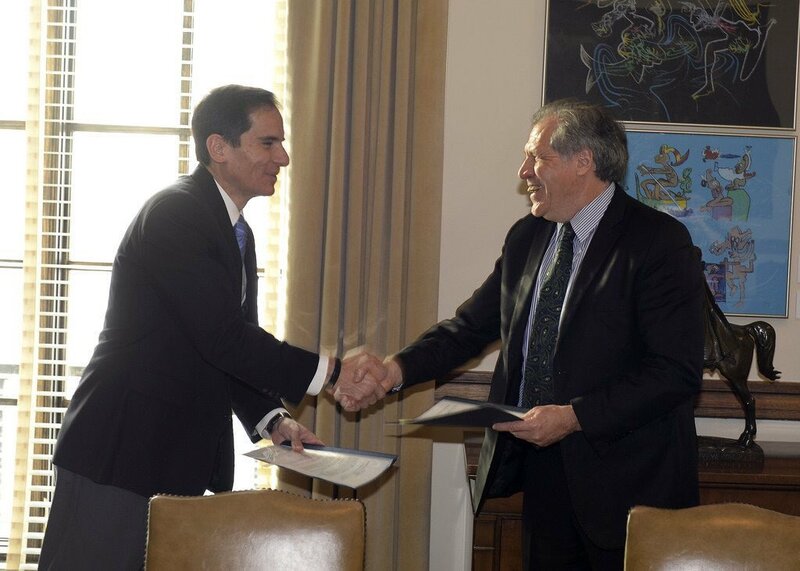 1/29/16 CEQ signed a Memorandum of Understanding with the Organization of American States to deepen the relationship between the two institutions and look for ways to cooperate on joint project, programs and activities in the are of social inclusion, equity and social protection. 1/20/2016: On January 20th, Professor Stephen Younger presented the final results of the CEQ Assessment Tanzania in Dar Es Salaam, Tanzania. Prof. Claudiney Pereira presented the Commitment to Equity methods and cross-country results in Ecuador Workshop "Igualdad y erradicación de la pobreza"
CEQ: Taller de entrenamiento, Ministerio de Finanzas, Asunción, Paraguay. Sean Higgins. Nora Lustig - Presented at the 1st International Seminar, A World Without Poverty in Brasilia, Brazil. 3/1/2014 -How can fiscal policy be better aligned with scaling up service delivery? ICEFI holds a kick-off workshop to launch a rural-urban CEQ in Central American countries with funding from IFAD. For more information click here. LCSPE Workshop "Does LAC have the Capacity to Redistribute"
The Effects of Brazil's High Taxation and Social Spending on the Distribution of Household Income by Sean Higgins and Claudiney Pereira. The Impact of Taxes and Social Spending on Inequality and Poverty in Argentina, Bolivia, Brazil, Mexico, Peru and Uruguay: An Overview by Nora Lustig. Social Spending and Income Redistribution in Argentina During the 2000s: the Increasing Role of Noncontributory Pensions By Nora Lustig, Carola Pessino. 3/12/2013 - Equity Day - Colombia. 01/21/2013 - Methodology of the Fiscal Incidence Analysis. Nora Lustig and Sean Higgins - Tulane University African Development Bank - Tunis, Tunisia. 12/04/2012 - Who pays taxes and benefits from social spending? Fiscal incidence analysis by ethnicity and race: Bolivia, Brazil, Guatemala and Uruguay. Nora Lustig – Tulane University, CGD and IAD Inter‐American Development Bank, Washington, DC. Nora Lustig and Sean Higgins - Department of Economics - Tulane University LACEA–LAMES. Lima, Peru. 09/12/2012 Gasto Social, Impuestos y Redistribución de Ingresos en Uruguay. Marisa Bucheli, Nora Lustig, Máximo Rossi and Florencia Amábile. CEQ – Tulane University – CIPR – Inter-American Dialogue – Departamento de Economía Facultad de Ciencias Sociales Universidad de la República. Presentación para el Ministerio de Economía y Finanzas, Montevideo. 06/07/2012 - Fiscal Incidence Analysis in LA: Methodological Issues and Results. 06/01/2012 - Fiscal Incidence, Fiscal Mobility and the Poor: A New Approach. 05/21/2012 - Política fiscal, desigualdad y pobreza en Bolivia, Brasil, México y Perú. ¿Cómo le va al sector rural? Nora Lustig - Tulane University Center for Global Development and Inter-American Dialogue. Desarrollo rural en América Latina: preguntas, perspectivas y desafíos. Fondo Internacional de Desarrollo Agrícola (FIDA) Antigua, Guatemala. 05/15/2012 - Taxes, Transfers, Inequality and Poverty: Argentina, Bolivia, Brazil, Mexico and Peru. Nora Lustig – Tulane University Nonresident Fellow Center for Global Development and Inter‐American Dialogue Brookings Institution, Washington, D.C.
Nora Lustig – Tulane University Nonresident Fellow Center for Global Development and Inter‐American Dialogue Inter-American Dialogue and Tulane University Inter-American Development Bank. Washington, DC. 05/14/2012 - Taxes, Transfers, Inequality and Poverty: Argentina, Bolivia, Brazil, Mexico and Peru. Nora Lustig – Tulane University Nonresident Fellow Center for Global Development and Inter‐American Dialogue IMF, FAD. Washington, DC. 04/20/2012 - Taxes,Transfers, Inequality and Poverty In Latin America. Nora Lustig – Tulane University Network on Inequality and Poverty, LACEA, Columbia University. 04/19/2012 - Taxes, Transfers, Inequality and Poverty in Latin America. Nora Lustig - Tulane University. Brown University. 03/13/2012 - Compromiso con la Equidad. Política fiscal, desigualdad y pobreza en América Latina. Nora Lustig – Universidad de Tulane "El rostro fiscal de Centroamérica en el nuevo contexto mundial" ICEFI, Guatemala. 11/03/2011 – Fiscal Policy, Inequality and Poverty in Latin America Commitment to Equity (CEQ) Workshop.